I was determined to make each of my girls some mittens for Christmas. I threw out some subtle hints to see what they might like. My seven year old was easy, as recently she has been drawing clouds with lightning bolts all over everything and likes blue, so navy lightning mittens it was. My five year old was a bit more tricky so in the end I just had to ask her exactly what she wanted. She requested some purple panda mittens! I’ve never been particularly fussed about the colour purple and was completely underwhelmed with Pantone’s 2018 Colour of the Year being Ultra Violet. But then I found this purple British wool in my local yarn shop and I couldn’t get enough of it. It’s funny how that happens sometimes isn’t it. It's called Pennyroyal from West Yorkshire Spinners and is the most beautiful shade of dusty purple. It’s muted, more greyish than pinkish, and a good unisex option that isn’t monochrome. I became a bit obsessed with it and used it all over my AW18-19 collection. The collection is called Look Up and is inspired my kids’ child like ability to look up and notice all the beauty that I often miss because I’m too busy, be it a funny shaped cloud or the moon in the day time. The collection features rain clouds, rainbows, stars and planets and is a little prompt for us to do the same and look up. Purple made its way into the collection in the form of a Rainbow Beanie and matching How to Catch a Rainbow Mittens. But there are also hints of it all over the place; you can find it in a raindrop, part of a rainbow and for the planet elbow patches in my Space Cardigan. I was quite excited to try out my Panda Mittens in this purple. 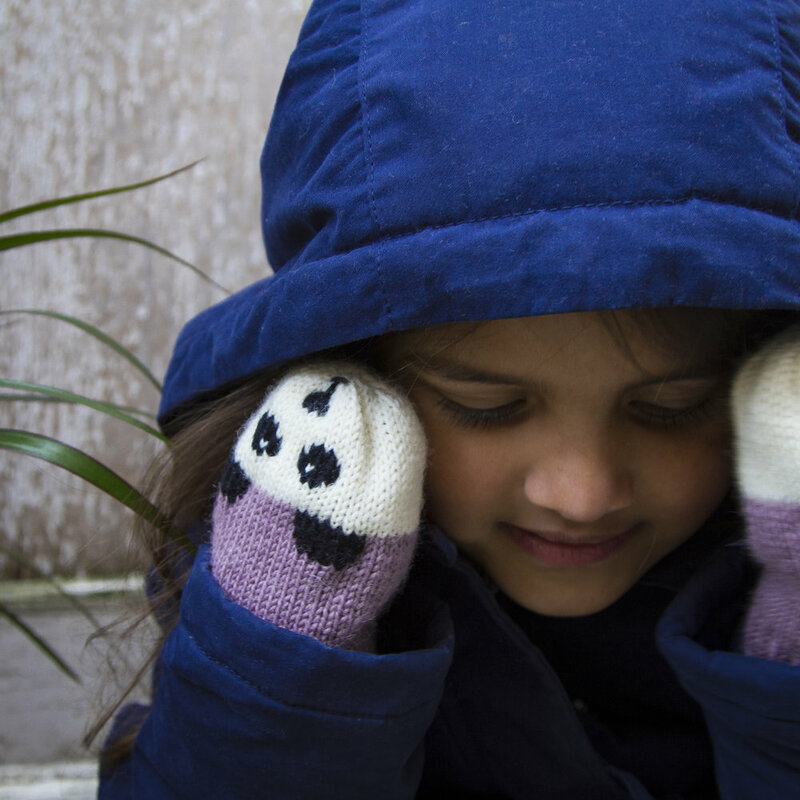 I’ve made panda mittens in grey, mustard yellow and rust before and the design has worked well in each of these. 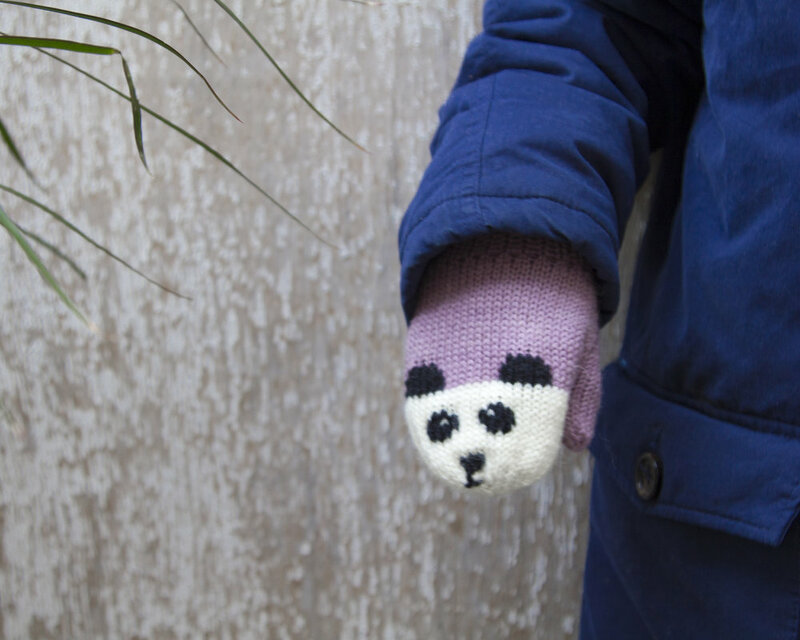 And having made panda mittens in these colours so many times, it was fun to try out something new. I was so pleased with how they turned out. My five year old loved them, making it worth staying up quite late on Christmas Eve Eve to finish them! She’s worn them every day and they have come particularly handy with the super chilly weather we’ve been having. I shared them on my stories and the response was lovely so I decided to make a few more pairs. So here they are! These are currently being stocked at The Mamahood Winter Pop Up and if they go down well I shall make some more. But for now, the Pop Up is the place to head if you'd like some!